Eight years after it was started by a 19-year-old college freshman as a blogging software, WordPress now powers 14.7 percent of the world’s top one million websites. It is used in 55 million websites. In his annual State of The Word address last week, WordPress founder Matt Mullenweg also said the open source content management system (CMS) now runs 22 out of every 100 new websites created in the US. The velocity in WordPress adoption and its dominance illustrate the strength of the open source model, where the community is involved in the development of the software. It is not a coincidence that the top open source CMS packages today, WordPress and Drupal, also have the most active developer and user communities. Matt Mullenweg giving his State of the Word 2011 address. SOFTWARE engineers from all over the country are scheduled to meet in a conference in Cebu City on Friday, June 26, to talk about technical issues on software development. DevCon Visayas offers free admissions to its technical sessions on such topics as cloud computing, social networking and content management systems through sponsors Oracle and G2iX. Organizers are asking those interested to join the conference to register online at http://www.devcon.ph/. Users, developers, and supporters of the open source content management system (CMS) Joomla will be meeting in Cebu next Saturday, June 7 at the Lepiten & Bojos Law Office on Don Pedro Rodriguez St. in Capitol Site, Cebu City (see map below). The meeting is preparatory to the Joomla Day that will be held in UP Diliman on June 14. During the meeting, members of the Joomla community in Cebu are scheduled to plan activities for a year and consider participation in a coming Open Source summit in Cebu on June 23 to 24 at the Cebu International Convention Center. The Open Source summit will have a track on Drupal, another popular open source CMS. My redesign of Cebu Living, an online magazine on Cebu, is now live. Check it out. It’s using a WordPress theme for news and magazine websites. The new theme still needs a lot of work but if you want to try it out, you can do an anonymous svn checkout: svn checkout http://svn2.assembla.com/svn/cebulivingmagazine. Just go through the template files and see what needs to be changed for your site. I promise a commented version of the template files soon. Unlike the previous Cebu Living theme, which I ported from an open source CSS/XHTML design, I built this new one from scratch. And it shows. I’m not a designer, in fact, I’m bad at designs. But the new theme incorporates elements I, as publisher, wanted from a site run as an e-zine and using WordPress as content management system (CMS). I will be releasing the theme as soon as I finalize it. If you have comments on the new design, please leave it in this post or send it as an e-mail so that I can consider incorporating it in the theme. I’ve been studying Drupal these past months. Drupal is a highly-regarded open source content management system (CMS) that can run anything from a single-person website to a community portal. There’s even a Newspapers on Drupal group for people using the CMS for their news websites. NOW SHOWING. 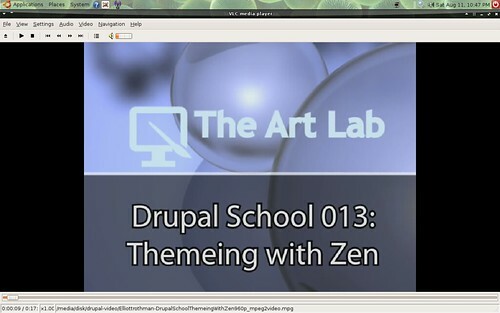 I’ve downloaded Elliott Rothman’s video tutorial series on Drupal. Rothman’s tutorials are really helpful for newbies who want to learn how to use Drupal as content management system. Click on photo to enlarge. Drupal, unlike many other open source CMS, seems to be much more technically challenging to use, especially for non-geeks like me who can’t program. It took me a couple of months of studying and experimenting with WordPress to be able to confidently make it work for a project the way I wanted it to work. WordPress can be used to run a news or magazine website and I’ve done this for several projects. I am also currently writing a new article on how to use WordPress to run a news website and will be releasing a new theme for it. It’s for a personal project that I was supposed to launch this weekend but got delayed by work deadlines. While I love WordPress and have been using it for most of my personal projects, I want to learn how to use Drupal extensively because I see it as the better CMS for larger, more complex, and community-oriented web projects. Some of the sites running Drupal are The Onion, MTV UK, Canadian Broadcasting Corporation’s Exposure, and The New York Observer. The New York Observer’s use of Drupal is particularly noteworthy because its development team discussed how they did it in this article on the relaunch of the newspaper site using Drupal. 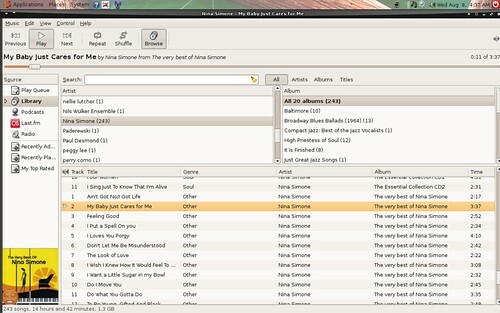 In my Sony Ericsson K750i, I have at least 50 Nina Simone songs. I have several Nina Simone CD compilations I repeatedly play at home. When our youngest son can’t sleep, I play her music. I first heard Nina Simone sing in, of all programs, BBC’s HardTalk. During the interview, she told Tim Sebastian, the program’s host then, “I need a cigarette. You’re making me hot.” The diva that she is, she smoked during the interview. I installed the Drupal 5.0 beta 1 release yesterday and the installation was so easy it could rival WordPress’ famous five-minute installs. I’ve long wanted to try the open source content management system and for several months now, “try Drupal” has featured prominently in my someday/maybe lists (plural because I kept transferring and playing with new task managers). It became prominent after I found out that The Onion is being run using Drupal. DRUPAL INSTALLER. The 5.0 beta release of Drupal comes with a web-based installation script. Click on image to enlarge. The new release comes with a web-based installer that simplifies the setting up of Drupal, After I downloaded the release and I uploaded the files to my test site, I was greeted with the installer when I opened the page, with the notice that I should add write permissions to the settings.php file. To those who were waiting for this theme, I apologize for the delay in the release. I had to wade through various folders to get the latest version of the code because I was working on two sites using this theme at the same time. I have since been using Subversion via a free project management account with Unfuddle (check my previous post) to make sure that the files are organized. If anyone is interested in helping improve this theme, leave me note so that I’ll host the files in Google Code and we can work on it together. Nautica-magazine is a WordPress theme based on the nautica05 open source template. It doesn’t work out-of-the-box because you need to edit the index page to make it work with your site’s sections or categories. Read the included readme.txt before activating the theme. I woke up to a WordPress database error yesterday. The error wasn’t caused by any changes I did to the site but something to do with the server. I spent hours the night before working on this, a demo of using WordPress to manage a news portal. With time to kill while waiting for the site to be fixed, I implemented something that had been listed in my “someday” list – customize the WordPress database error message and have the system send you an e-mail when your blog can’t connect to your database. I hate to admit it but I actually enjoyed the downtime as it taught me a lot as well as afforded me the time to play around with something I had long wanted to do. The hack is surprisingly easy and I enjoyed crafting a database error page that I just might intentionally place wrong config data soon to test my planned addition to the error page.